Heat stable silicone release agent. Non-staining. Prevents build up of static electricity. Overcomes friction. Prevents bunching of fabrics during sewing or cutting. Prevents rust. Sili-Slide. Dyno Sili-Slide Spray is absolutely safe. 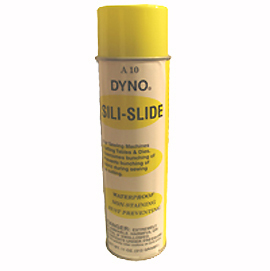 Dyno Sili-Slide Spray is colorless- will not damage any type of cloth. It is harmless to the skin- metals, glass, plastic, etc.